OBAMA’S DICTATORSHIP IS ALMOST COMPLETE? Senate Bill 1867, also known as the National Defense Authorization Act, is the means by which Congress funds the military and is therefore a “must pass bill.” No politician wants to be the one who voted to defund the military, especially if you are a so-called conservative. Those who would be disposed to usurp the Liberties of this land take these must pass bills and convert them into Trojan horses. This particular Trojan horse puts the due process rights of American citizens in serious jeopardy through sections 1031 and 1032. Sections 1031 and 1032 of this bill are completely unrelated to the funding of the military. These sections, we are told, will ‘save us from terrorists’. The plan is to remove the Constitutional right of habeas corpus and persons deemed to be terrorists will be detained indefinitely, out of the country. The built-in premise is that the right of habeas corpus is somehow a threat to national security. There you have it. All limitations fly out the window if the government determines a “national security interest”. But those that planted these loopholes are not finished. 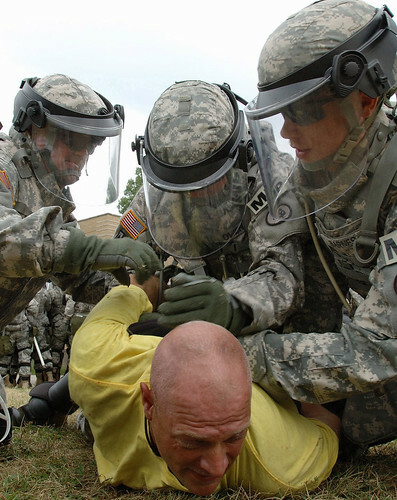 Section 1032(b)(1) states “The requirement to detain a person in military custody under this section does not extend to citizens of the United States.” Is this the part that is supposed to stop the government from detaining US Citizens? Any decent attorney would tell you that the “prohibitive language” in this statement is a bit ambiguous. What this section says is the REQUIREMENT to detain doesn’t extend to US Citizens. That means they don’t have to detain them, but what if they want to! All this sounds a bit alarmist right? Why do I think the language is cleverly crafted to be more than it appears? Because those who support this bill do not WANT to protect the liberty of US Citizens. They will, when cornered with the truth, tell you that any US Citizens who is involved with terrorists “DOES NOT deserve Constitutional rights.” The idea that US Citizens do not deserve their Constitutional rights is a very frightening statement. But put that in conjunction with the understanding that it is the government, specifically this current administration, that gets to CHOOSE which citizens do not deserve their Constitutional rights. Senate bill 1867 now will go to a group of conferees made up from both the Senate and the House. The House members have yet to be chosen, but the following list is of the Senators; Levin; Lieberman; Reed; Akaka; Nelson of NE; Webb; McCaskill; Udall of CO; Hagan; Begich; Manchin; Shaheen; Gillibrand; Blumenthal; McCain; Inhofe; Sessions; Chambliss; Wicker; Brown of MA; Portman; Ayotte; Collins; Graham; Cornyn; Vitter. All of these voted for this bill; three Republicans, three Democrats and Independent Bernie Sanders voted against this bill. Please call the Senate and House conferees to stop sections 1031 and 1032 of the bill. Read the complete articles and call your Congressman and Senators! Senate conferees with phone numbers are listed here. WHO WILL PROTECT YOU FROM A TYRANICAL GOVERNMENT? LET US TAKE OUR COUNTRY BACK! Credits and links are provided in the complete articles. Will you be the one? Action Alert: Register Now, Day at the Capitol!